Wharton Social Impact Initiative is pleased to announce that Derek Handley will be added to the list of social impact innovators to visit campus through the Angella and David Nazarian Social Innovator in Residence Program. The Nazarian Social Innovator in Residence Program aims to foster meaningful interactions between current students and prominent social visionaries. Hosted by Wharton Social Impact Initiative, the two-year-old program brings innovative business leaders to Penn for two to five day periods, and provides a unique learning opportunity for students interested in pursuing careers with an emphasis on social impact and responsibility. The Innovators in Residence host group sessions, meet with students individually during office hours, and lead discussion groups and workshops while on campus for an annual visit. Previous guests have included Diana Ayton-Shenker and Liesel Pritzker Simmons. Handley is a New York-based social entrepreneur from New Zealand. Derek was Founding CEO of The B Team, where he worked with Sir Richard Branson to form a group of global leadership icons catalyzing better ways of doing business for people and planet. He helped recruit the founding team of sixteen members, including Arianna Huffington and Nobel Laureate Professor Muhammad Yunus. While at Wharton, he will launch his latest project, Aera VC. 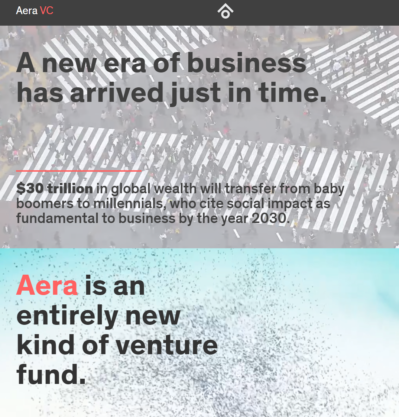 The website for Handley’s latest project, Aera, launching during his residence at Wharton. In 2015, Derek was named a visionary leader on two “Top 100” global leadership indexes and was listed as one of the top 10 most influential social entrepreneurs on Twitter. He is a former New Zealand EY Young Entrepreneur of the Year, inspiring others with the release of his first book Heart to Start, which shares the story of his entrepreneurial journey and doubles as a practical field guide to pursuing personal purpose. Derek has helped found multiple companies in digital media and technology and is currently a member of the Air of New Zealand Sustainability Advisory Panel, and Adjunct Professor at AUT, and a director of Sky Television. He has also signed up to go to space with Virgin Galactic as an aspiring astronaut. Join us for one of several small-group events! All students are welcome, but an advanced RSVP is required. Thursday, Nov. 3, 8:30-10 a.m.: Innovators Breakfast — Join us for breakfast and coffee, while Handley talks about his experience and takes questions from attendees. Thursday, Nov. 3, Noon-1:20 p.m.: Lunch Discussion — This is your final opportunity to meet Derek Handley! In a small-group lunch, Derek will discuss his experiences and take questions from attendees. Aspiring social entrepreneurs can also meet with Handley in 30-minute one-on-one sessions on Wednesday and Thursday. These exclusive meetings are scheduled on a first-come basis—so sign up now!